This week’s theme: revisiting an old classic, The Organization Man. Plus catching up with the recipients of the Saildrone Awards. Happy new year and welcome to Snippets in 2019! I hope you all had a resting and relaxing holiday break, and are ready to hit the ground running for the new year. From our perspective in the technology startup ecosystem, it’s a glimpse into another world. It’s a world of regimented uniforms where everyone wears the same white shirt, everyone lives in the same suburban house and aspires to the same country club, and everyone breathes a particular kind of “team-oriented” management air that rejects individual heroism and celebrates the accomplishments of the group. The ethos of this world celebrated a particular kind of conformity, wrapped in the idea of team effort and “scientific management optimization”; some of it legitimate, some not. This is the world of Whyte’s Organization Man, and over the course of the book we peek into all sorts of aspects of this social order: at work, at home, and in their heads. From today’s vantage point, it’s pretty cringe-worthy — at least at first. As you read further into the book, you start to realize that this whole value system, even though it’s a very foreign sort of ethic that we don’t celebrate here, nonetheless feels oddly familiar. One clue shows up early on in the book, when Whyte talks to college seniors about their goals and aspirations. Today, if you go to any college campus or especially to elite institutions like HBS or GSB, the culture overwhelmingly celebrates entrepreneurship, risky new startups, and bold individual initiative. Being a founder is the ultimate status symbol, and hardly anyone going through interviews in their senior year feels as though they’re joining an organization for life. Back then, it was the reverse: aside from the occasional management student who planned on taking over the family business, nearly everyone else when surveyed would happily share that their goal would be to join a major company like Dow Chemical or AT&T. The thing with this kind of simultaneously opportunistic and also mission driven mindset is that it works well if a large number of your peers have also bought into this mindset. Suppressing your individual desires and goals in deference to the group organization doesn’t necessarily come naturally; nor, would Whyte argue in The Organization Man, is it usually a good thing. Indeed, the massive bureaucratic corporate organization of the 1950s and 60s flies directly in the face of so much of the American social myth: it’s not entrepreneurial; it’s not individualistic or self-reliant or any of those other classic Protestant virtues that we historically celebrate. But if enough people really believe in this ethic, it starts to compound on itself: Big Business, armed with increasingly eager and pliable Organization Men, is able to actually pull off some incredible feats of production at scale that can only be accomplished by impossibly large bureaucracies and systems. It’s no surprise that large parts of America made a 180-degree cultural turn away from individualism and towards a conformist group mindset, because the results were there: businesses like AT&T, Dow Chemical and General Electric honestly made miracles for us. So what does all of this have to do with Silicon Valley and the tech industry today? At its core, these large organizations of the 50s and 60s worked because a critical mass of people had bought into something that reflexively became real. It’s what Yuval Harari would call an “intersubjective reality” in Sapiens, which unsurprisingly is beloved to an almost fanatical degree by some prominent tech leaders. The tech industry may seem cosmetically and socially a world of difference away from the world of The Organization Man. But at its core, it’s powered by the same phenomenon: a mass mindset that makes the whole place come to life, where white shirts are replaced with Allbirds and the country club is replaced by Barry’s Boot Camp. Over the next few weeks, we’ll unpack just what exactly that is, and why The Organization Man has a lot more parallels here than would be obvious at first glance. For highlighted reading links this week, first off, give a long hard look at this take from Byrne Hobart about one of the most sacred and entrenched parts of the American economy: the 30-year mortgage. The piece written in a way that’s accessible to any Snippets reader, but goes into a great deal of sophisticated depth that’s necessary to appreciate just how deeply weird the 30-year mortgage is as a financial product. (Bearing in mind, naturally, that essentially no other countries besides the United States have them.) At the core of this problem are these two weird asymmetries that (sort of?) offset each other economically: on the one hand, the fact that 30-year debt contracts where the borrower can perpetually refinance as interest rates fall but hold onto them while interest rates rise is obviously great for homeowners, but terrible for lenders. How is it offset? By the fact that homeowners (unlike lenders) are not hedging their real estate investments in any meaningful way at all, allowing for an incredible market distortion and resulting economic space that all kinds of strange inhabitants, from Fannie and Freddie to large mortgage purchasers to the financial crises actors — move around in. It’s a great piece and you should read it. At another end of the spectrum, there was some great Twitter discussion over the holidays about Fortnite, no doubt triggered by a bunch of tech people visiting their family over the holidays and witnessing firsthand how much their younger cousins are overwhelmingly consumed by this game. Anoop Ranganath and Owen Williams have a good take on it: Fortnite isn’t really a game; it’s a place where people go to hang out, and in that respect, it’s the same place that kids and teenagers have been visiting for generations. It also helps understand Fortnite’s bizarre but fabulously profitable revenue model, which makes complete sense in this new light. In this week’s news and notes from the Social Capital family, we have some fun news from Saildrone to share. As you may know, in 2017 Saildrone established a research prize called the Saildrone Awards meant to fund scientists pursuing big questions related to ocean physics, ecology, and air-sea heat and carbon exchange. The winners of the award are given 30 days of ocean collection from Saildrone’s unmanned surface vehicles, which would cost $1 million if done on a conventional research ship. The first-ever Saildrone Award, given in 2017, was awarded to Dr. Chelle Gentemann of Earth & Space Research, leading a coalition of 20 scientists focused on studying ocean currents off the shore of California. Satellites cannot map these currents, and research vessels are too expensive to capture them all in real time, but Saildrones can. With the 30-day mission expanded to 60 days through a fund match by the Schmidt Family Foundation, the mission was a great success, and analysis of the data is ongoing. The dataset is now publicly available, and if you’re curious you can find it here. More recently, a team led by Dr. Jaime Palter of the University of Rhode Island was awarded the second annual Saildrone Award. 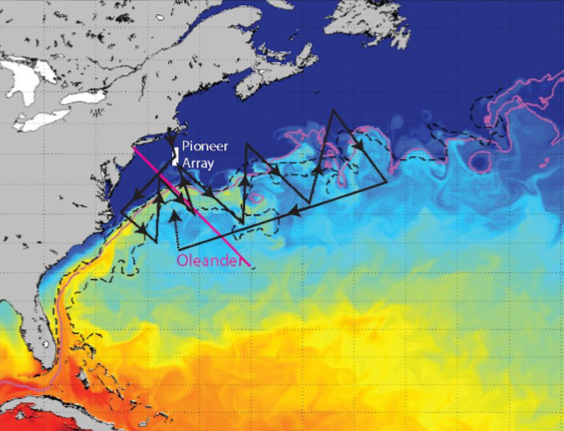 She is leading the study on the air-sea heat exchange and CO2 uptake in Atlantic currents, specifically the gulf stream. 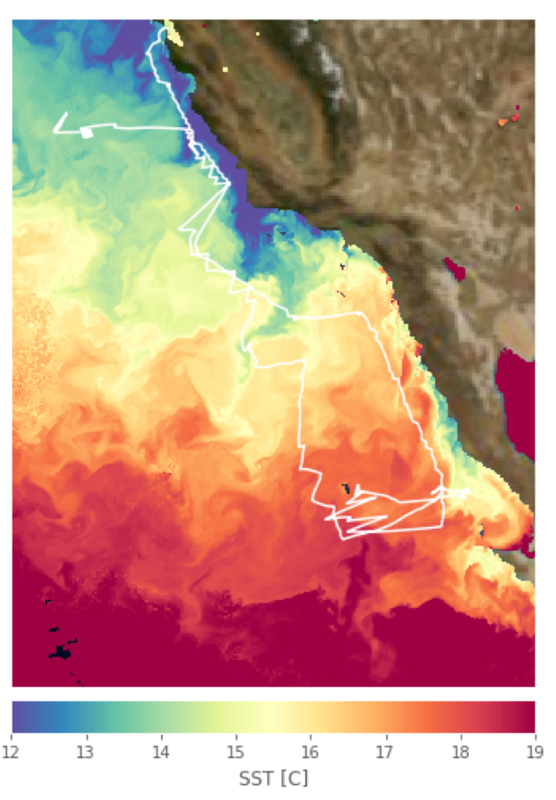 These “boundary currents” are crucially important for the environment and climate, but are very hard to observe: they happen quickly and transiently, making observation through conventional sea-borne vessels nearly impossible. Saildrones, on the other hand, can be a lot more patient. Dr. Palter’s team will help answer a crucial question for our time: how to measure and understand CO2 uptake and sequestration in the ocean, which is an enormous, poorly understood variable that we’ll need to address as we tackle climate change. Research will be underway throughout 2019. You can read more about the 2017 and 2018 winners of the Saildrone Award, or submit a proposal for an award here.